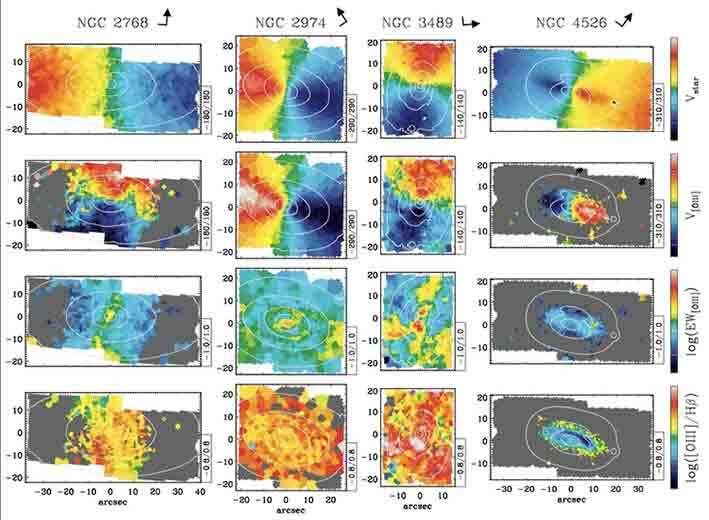 In the last ten years, integral-field spectroscopy (IFS) has contributed to important leaps in our understanding of the structure of nearby galaxies. IFS can indeed map simultaneously across the optical regions of galaxies the kinematics of both stars and ionised-gas, the basic properties of their stellar populations (such as age and metallicity) and the extent of AGN activity, all features that can then be compared with ancillary observations in other spectral domains and covering for instance other phase of the interstellar medium (e.g. hot, cold, and molecular). In this framework, we operate in the context of both the SAURON and ATLAS3D survey, working in particular on the ionised-gas phase of early-type galaxies. The figure shows, for four particular objects, how the ionised-gas kinematics compares to the stellar kinematics (which hold clues as regards the origin of the gas) and how the distribution and ionization (traced by the [OIII]/Hb line ratio) can considerably vary from galaxy to galaxy. SAURON maps for four galaxies representative of the gas properties in the E and S0 galaxies. From top to bottom: (i) the stellar velocity, (ii) the ionised-gas velocity, (iii) the equivalent width of the [OIII] emission line in Angstroms (in log units) and (iv) the value of the [OIII]/Hb ratio (also in log units). The cuts levels are indicated in the box at the right-hand side of each map. The grey boxes on the top figures indicate the field-of-view of the HST images in the last row. Notice how the gas distribution can vary from galaxy to galaxy, and how the kinematic major axis of the ionised gas deviates from that of the stars. The [OIII]/Hb ratio maps clearly reveal the presence of radial gradients and substructures in the ionisation properties of the gas. The low [OIII]/Hb values corresponding to the dust disk in NGC 4526 suggest ongoing star formation. The white contours in each maps delineate the stellar surface brightness distribution.